Even though the days are getting longer, it is still cold, wet and miserable here and soup pots are still on the hob in my kitchen! Soups are always a clever way to incorporate vegetables into the daily menu in the winter. I believe it is a great way to clear up your old vegetable stock too. 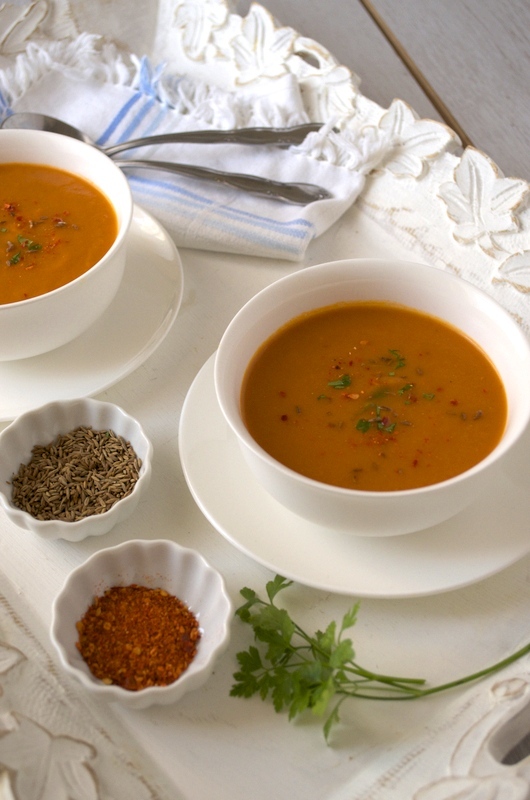 This tomato and carrot soup is made with plenty of tomatoes, carrots, onions and celery. I like to have my soup creamy and light so once the vegetables are cooked through, I puree it in a blender and then sieve it to get a silky smooth finish. It is up to you how much heat and spice you add to the soup. I like mine to be mildly spiced, with a touch of chilli and cumin, and I offer toasted spices on the side when served. Melt butter in a saucepan and sauté chilli flakes, cumin seeds and crushed garlic until they are fragrant. Add onion, celery and carrot to the above pot and sauté until onions starts to soften. Add tomato, stock cube, salt and enough cold water to cover the vegetables, and then boil it together. Cover and simmer gently for 20-30 minutes until the vegetables are cooked through. Remove from fire and cool it down. Blend the soup in a blender until smooth and then pass it through a sieve. Add more water or milk to adjust the consistency and boil it again when you are ready to serve.